Pathway lighting is one of the first types of lighting most homeowners install. After porch or entryway lighting, it is the second most common type of outdoor lighting on a home. However, its commonness is misleading, as many homeowners install pathway lighting, but don’t stop to think about it. It’s very common to see a simple row of cheap solar-powered stake lights along a walkway or driveway. Some homeowners install more permanent, brighter lights, but fail to think of them in coordination with their larger landscape lighting scheme. Whatever the case, pathway lighting is sometimes under-appreciated and poorly planned. But with these unique pathway lighting ideas, you can increase the visual appeal and overall effectiveness of your pathways and your home. Light as a Guide – Paths serve a unique function around your home. A path, by definition, is a way to show your guests where to go and how to get from place to place. Some paths are as simple as a walk down a driveway, across a lawn, or up to your front door. Other paths guide family and guests around outdoor areas to patios, pools, benches, and other outdoor amenities. If you have a garden, a path can be an integral part of your garden, showing guests around and giving them the chance to visit all the best spots. If you use any of these types of paths in the evening, nighttime, or early morning, lighting the way is critical. Lights along a path help ensure that family and guests can see the path and get where they are going. Safety – Lighting an area where you will be walking after sundown or before sunrise is crucial to the safety of your family and guests. Good lighting can reveal hazards and obstacles that would otherwise cause trips and falls. Allowing guests to see where they are stepping increases safety dramatically. Protect Your Landscaping – If you have flower beds, planters, or even just a sensitive lawn, you want to keep it free of unwanted foot traffic. A few misplaced footprints in your favorite flower bed could be catastrophic for the unfortunate plants that get trampled. Pathway lighting can serve as a guide to keep people safely on their path and out of your fragile landscaping. Overall Lighting Design – At its best, pathway lighting should be an integral part of your outdoor lighting scheme. That includes house lighting, pathway lighting, and landscape lighting. When they work together, each aspect of your outdoor lighting scheme blends with the others for overall visual appeal. Most homes that have path lighting use a single, usually simple fixture placed at even intervals along the path. But there’s no rule that says it has to be that way. In the right settings, a little variety can be beautiful. Now, this isn’t necessarily the look you’re going for along your driveway, but in a more fanciful setting, it can be truly magical. 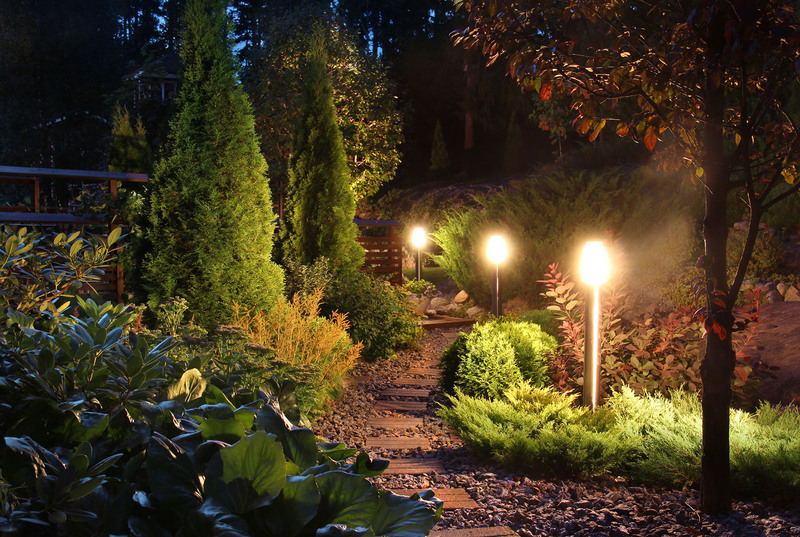 One of the best places to use mixed and matched path lighting fixtures is in a garden or landscaped area. Path lights should guide the way, but that doesn’t have to take the form of a landing strip. When you place a row of evenly-spaced lights along both sides of a walkway, you may end up with an airplane runway instead of landscape lighting. Think of light as a way to draw a guest forward along the path. While you want to avoid a misstep or hazards in the path, not every inch needs to be brightly lit. Think, instead, of your lighting as pools of light that pull you from point to point along your path. Each pool of light can have its unique feel. If you’re lighting a garden, each spot will have unique vegetation, so why not a unique fixture? Feel free to experiment. You could mix and match whimsical fixtures for an enchanted feel, or explore different geometric shapes with modern designs. If you’re not as confident in your mixing and matching skills, having a professional designer like Night Vision Outdoor Lighting can make all the difference. We’ve done over 5,000 projects, and we’ve seen more pathway lighting fixtures in our time than you could possibly imagine. Our experts can help you find the perfect combination for your home. Traffic bollards keep vehicles out of pedestrian walkways. What is a bollard, you ask? Simply put, a bollard is a pole. More specifically, it is a short, fat post, usually around two to four feet tall. There are a few types of bollards out there. Originally, a bollard was a short post used to tie up a ship when it came in to dock. A more common use for bollards today is to direct traffic, and specifically to keep cars out of an area. To make them more visible at night, some bollards had lights built into them. Once that happened, it wasn’t long before some landscape designers started using bollards to light up pathways. 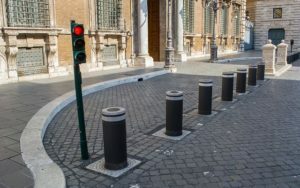 Bollards are much sturdier than most traditional path lighting fixtures, so they have become very popular in commercial settings. Sometimes they are installed by a city both to light a path and separate foot traffic from street traffic. Often they are installed around office parks or other commercial buildings, both as a light source and for traffic control. Increasingly, designers are using scaled-down bollard lights for residential landscape lighting. They can provide a unique look, especially for more modern homes. Since a bollard light is really just a post with a light in it somewhere, the design options are really endless. Bollards range from minimalist rectangular slaps or aluminum tubes to artistically sculpted modernist designs. You don’t always need a path light to light a pathway. One unique way to light a path, especially in a backyard hosting area or garden, is with artificial moonlight. Artificial moonlight is a specialized application of downlighting that can provide enough light to safely navigate without any need for additional path lights. The goal of artificial moonlight is to replicate the look and feel of walking beneath a full moon on a clear night. It is romantic, calming, and beautiful. It’s also a great way to light a large area without a ton of visible fixtures. We hope we’ve got you thinking now about your own unique solutions for pathway lighting. If you’re feeling inspired, but you don’t know where to start, we can make a suggestion. Contact Night Vision Outdoor Lighting. Our expert technicians and designers will come to your home for a consultation. We take the time to really listen to a homeowner’s needs, budget, and style interests before offering design ideas. Then we’ll work with you to get the results you hoped for.